Educational Qualification :- Fellow/Associate Member of Institute of Company Secretaries of India (ICSI). 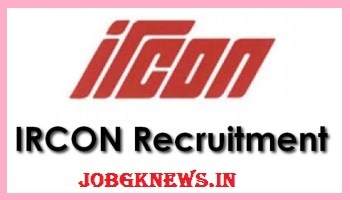 IRCON Selection Process :- Selection will be based on Interview. Application Fee :- General & OBC Candidates have to pay Rs.1000/- (Rs.250/- for SC/ST/ex-Serviceman) through Demand Draft in favour of IRCON International Limited” payable at ‘New Delhi’. How to Apply IRCON Job Vacancy :- Interested Candidate may apply in prescribed application form along with self-attested photocopies of required documents & envelop super scribed “Application for the post of ___Advt. No. – 18/ 2017” send to Joint General Manager/HRM, IRCON International Limited, C-4, District Centre, Saket, New Delhi – 110 017 on or before 13.10.2017.